In the early-1950s, when it became widely known that smoking caused cancer, giant tobacco companies formed the Tobacco Industry Research Council (TIRC). Its main goal was to deny the harmful effects of tobacco and confuse the public. The tobacco lobby wormed its way into the United Nations’ World Health Organization (WHO), wreaking havoc and slowing the WHO’s efforts to reduce the growing number of cancer deaths. Realizing that the tobacco corporations were obstructing progress, the WHO finally built a firewall between public health officials and industry lobbyists. Only then was it possible to better control tobacco. Flash forward to Paris and the 21st annual UN Climate Conference, November 30 to December 11 The 190 participating countries are charged with trying to hold carbon emissions to liveable limits between the years 2020 and 2030. But – just like when the tobacco lobby was powerful – the fossil fuel lobby is strongly influencing decisions to be made in Paris. Pointing to the struggling world economic situation, theWorld Business Council for Sustainable Development (WBCSD) says climate change is important, but it should not jeopardize economic growth. Fossil fuel corporations have spent billions-of-dollars over the years funding front organizations that mislead and confuse the public by claiming that climate change is not serious threat. But scientists say that the human race cannot continue to function in a near-normal way unless about 80 per cent of the remaining fossil fuels are left in the ground. The corporations oppose government regulations, and their main goal is to have the marketplace determine the amount of carbon emissions. However, public interest groups believe that industry will serve its own interests for profits instead of prioritizing the reduction of carbon emissions. Instead of governments taxing emitters – a simple and inexpensive system to operate – corporations want to create a world market where polluters and investors can buy and sell carbon credits. They claim the system would help spur investments in low-carbon energy However, this system has worked poorly in Europe and is vulnerable to abuse. The fossil fuel industry wants governments and the public to acknowledge natural gas as a “clean energy source.” This would result in significant increases of fracking in many parts of the world. It’s true that gas, when burnt, has low emissions, but the fracking process leaks methane into the atmosphere, which is 80 times worse than carbon. The ‘net zero’ proposal: Rather than attempting to reduce emissions to zero, ’net zero’ means that some emissions can keep rising. The industry says this would be offset in the future via the removal of emissions from the atmosphere when yet-to-be developed technologies make the removal possible. According to Shell, going to net zero would allow them to keep burning fossil fuels for the rest of this Century. This would be balanced off by the – so far – theoretical removal of carbon from the atmosphere at some point in the future. In addition, some of France’s dirtiest corporations are official sponsors and donors for COP21. Included are nuclear and coal giants EDF, energy utility corporation Engie, coal-financing bank BNP Paribas, and airline Air France. Some of the very corporations driving global warming will be represented in Paris. Included will be Shell, BP, Volkswagen, Monsanto, Total, Dow Chemical, Monsanto, Syngenta, Nestles, McDonalds, Walmart and others. Fossil fuel companies have not managed to get a much coveted seat at the actual negotiating table during COP decision-making. But they are lobbying so hard that they hope politicians will come up with pro-industry solutions. Meanwhile, a growing number of public interest groups want the fossil fuel lobby barred from the UN process. 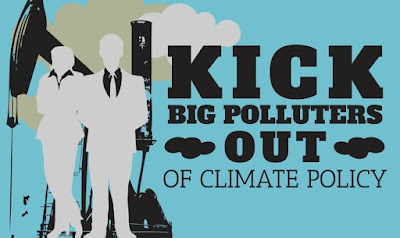 NGOs have launched a campaign, Kick the Polluters Out and are planning demonstrations in Paris. Close to a half-million people signed the protest document over a short period of time. But, at the present time at least, it would be very difficult to get the fuel lobby organizations out of the climate change process. In what critics consider a betrayal of the climate control effort, after a few years inside the system, UN experts move over to the private sector. According to the Corporate Europe Observatory, this revolving door helps business to control the process in the COP process. At the national level, because oil, coal and other fossil fuel corporations are so wealthy and so important to national economies, corporations are able to intimidate governments from taking the best possible carbon reduction pledges to Paris. 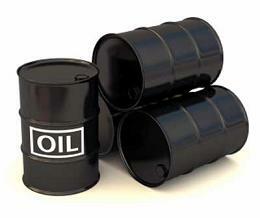 Energy corporations are successful in compromising the policies of the U.S. government. In October, the European Parliament expressed concern that an early analysis government pledges indicated the temperature would increase between 2.7 and 3.5 degrees Celsius. An increase within this range would be disastrous for humankind. The European Parliament has now called on governments to agree in Paris to revise the projections downward before 2020 to keep the increase to 2 degrees Celsius, which is the target recommended by scientists.